I was surprisingly restrained with my retail spending on this trip. Usually I view a trip to New York as a ‘free pass’ to spend like crazy. I tried really hard to find a new pair of jeans, but nothing was quite right. I very rarely get out these days to go shopping, and even still I just found myself making mental notes for ideas I wanted to try making for myself. 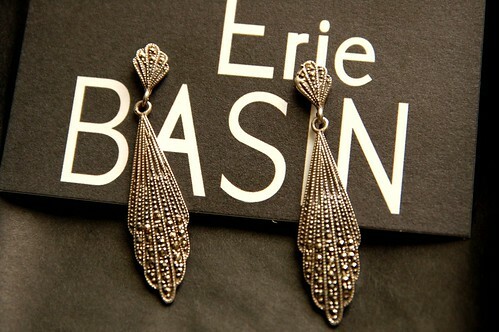 When we were at Erie Basin, Andrew saw this pair of vintage earrings that caught his eye. He had me try them on and we both loved them, so he gave them to me as a gift! Just looking at these earrings makes me imagine all kinds of wonderful stories of where they have been. 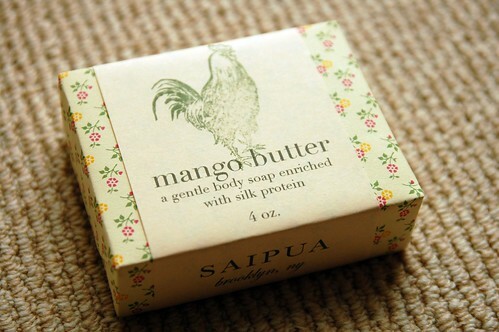 I bought a Mango Butter soap from Saipua. I can’t wait for my current soap to run out! I finally bought a ‘Found My Animal‘ leash for Maisy. I almost bought one on our last trip to New York, but didn’t. Then I saw this photo on the Sartorialist – it kinda looks like me and Maisy. (Now I just need to make a cute blue layered dress) I was so happy to find that they had them at Smith & Butler. The concept behind Found My Animal is really great. They are trying to raise awareness and money for adopting animals. 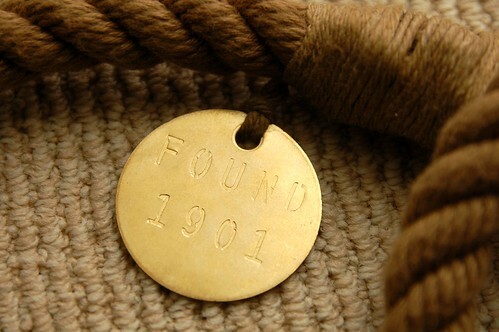 Each accessory they make is numbered to indicate how many animals have been helped by their products. 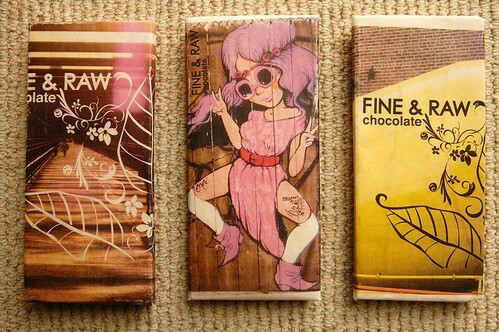 I bought a stack of Fine & Raw chocolate bars as gifts. (and a couple for myself) I love their packaging and couldn’t resist the one with the Fafi artwork. (I LOVE her) That bar has dried wild blueberries in it – YUM. The last morning we were there I went on a solo mission to B&J Fabric. When I want a little ‘fix’ of NYC fabric shopping, B&J is my best bet. It’s so well lit, organized and not too big. 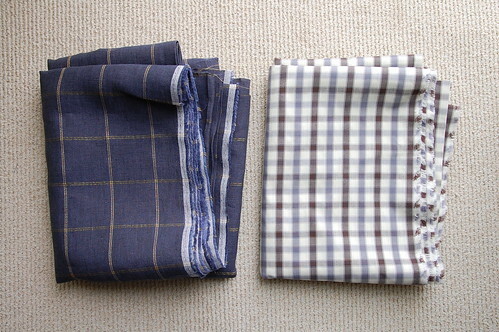 I’ve really been liking checks, gingham and plaids recently. The navy blue fabric is linen with gold thread detail. I imagine this future dress will have a cute yoke or perhaps bib front. The purple and grey plaid is cotton shirting and I’m not sure just yet what that will turn into. Hopefully I’ll be showing you real soon! Cool, those leashes are really nice! and the foundation is pretty neat too. Aww you got a great number! 1901! ooo are those marcasite??? such a pretty find! Gorgeous finds! 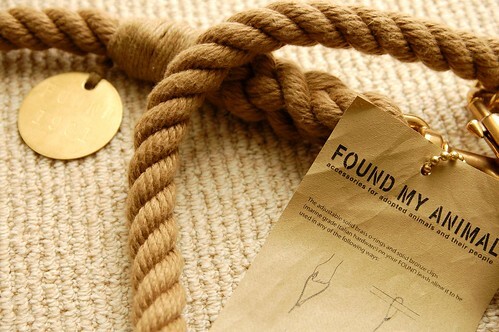 I love those Found animal leashes, I can’t wait to have a found animal of my own someday. Girl I love those earrings. I have some vintage earrings that mother gave me because I always have loved them so much she inherited them from one of her aunts. Those jewels are beautiful. I’ve always and still plan on going to NY and of course visit Brooklyn. I know you had lots of fun. I’m kind of like you since I’ve been creating things I very seldom buy I like to look and get ideas and I always say to myself I could make that or those it’s like you start to really look at life and things differently.